On your federal income tax return, you can claim dependents to reduce your income taxes for the 2017 tax year. Often, dependents are just your children. However, in some cases, such as if you are taking care of an elderly parent, you might be entitled to claim another adult on your income taxes to lower your tax bill. The IRS offers two ways that someone can qualify as your dependent for income tax purposes: either as a qualifying child or as a qualifying relative. Don’t let the names fool you. A qualifying child doesn’t always have to be your biological child who is under 18 and a qualifying relative doesn’t always have to be someone who appears on your family tree. Regardless of which test you are using to claim another adult as your dependent on your income taxes, you must meet some general criteria. 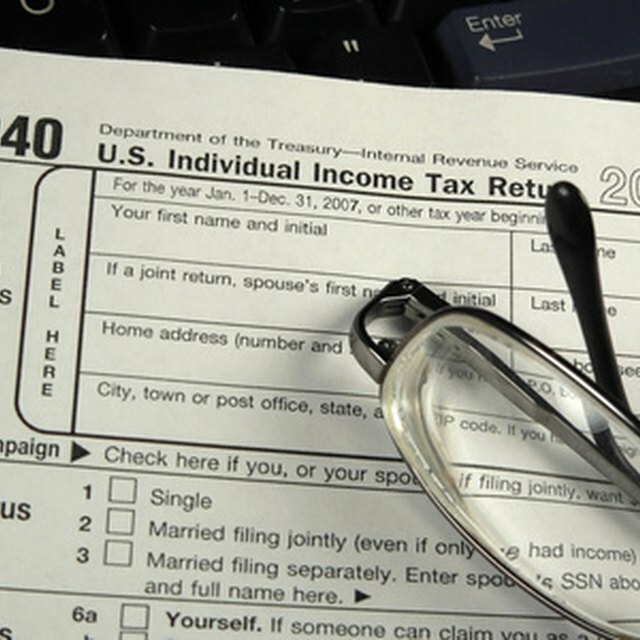 First, you can’t qualify as a dependent on someone else’s income tax return. If you’re married and file a joint return, your spouse also can’t qualify as a dependent on someone else's return. Second, you can’t claim someone who is married and files a joint return unless that return is only filed to refund tax withholding. Third, the adult you’re claiming must be a U.S. citizen, U.S. resident alien, U.S. national or a resident of Canada or Mexico. To be a qualifying child, the person must be your child, stepchild, foster child, sibling, stepsibling or a descendant of any of those people, such as a grandchild. Typically, a qualifying child must be under 19 years old at the end of the year and younger than you, but an adult can still qualify if younger than age 24 and a full-time student, or at any age if the adult is permanently and totally disabled. The person must live with you for at least half the year and must not provide more than half of his own support. Finally, the person can’t file a joint return except to claim a refund for tax withholding. To claim someone as a qualifying relative, the person can’t eligible to be claimed as anyone’s qualifying child. In addition, the person must be related to you or must live with you for the entire year. Relatives who don’t have to live with you include your lineal ancestors and descendants, such as parents, grandparents, child, and grandchildren. It also includes siblings, stepparents, nieces, nephews, aunts, and uncles. In addition, the person’s total income for the year can’t exceed $4,050 and you must provide more than half of that person’s total support. Can I Claim My Sister's Child on My Taxes? Can I Claim My Sibling on My Taxes? What Do "Exemptions" Mean on a Tax Return? Each dependent you claim allows you to take an additional personal exemption on your tax return. For the 2018 tax year, each exemption reduces your taxable income by $4,150. But, that doesn’t mean you’ll pay $4,150 less in income taxes. Instead, you must multiply the value of the exemption by your marginal tax rate, which is the tax rate you pay on your last dollar of income. For example, if your marginal rate is 10 percent, one exemption will save you $405 on your taxes. But, if your marginal tax rate is 30 percent, that same exemption will save you $1,215 on your taxes.